There are two ways to look at Burnham Down: it's either a long, gradual downhill off Burke Mountain or a much more fun ascent to access other trails on the mountain than the slog up Mountain Road. In this sense, there should really be a different sign as you approach from either direction: one that reads "Burnham Down" and one that reads "Burnham Up." Both names offer fodder for many puns. Any way you look at it, the trail has something for everyone. It's a bit more gnarly than most of the trails on the Darling Hill side of RT 114 and the Passumpsic River; but even still, it has its moments of flow and guile. It's more gradual and less steep than other ascents and descents in the area; but this doesn't detract from its speed or its ability to burn up the old quads (especially after the initial climb from the parking lot up the road to the trailhead past the cemetery on your right). Most of all, it has bridges. Long bridges. This is why some sources designate the trail as double black in difficulty. Don't let this designation lead to your resignation. The bridges aren't too high off the ground and generally get broader just when you need them to around the bends. 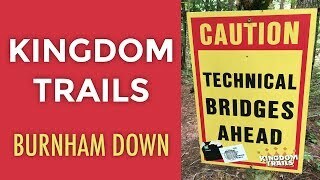 Speaking of bridges, keep in mind that this side of Kingdom, and this trail in particular, don't drain particularly well. There will likely be lots of mud if it's rained recently. When this is the case, the roots and bridges can become rather slick and greasy. On most maps, this trail is one of two singletrack connectors between the Darling Hill side of Kingdom and the Burke Mountain territory (the other being Moose Alley). As such, to me this trail is an emblem of adventure. It either catapults you from the Village into the wilder, more rugged terrain on Burke Mountain or welcomes you back into civilization. Either way, you're having a great day out on the dirt.